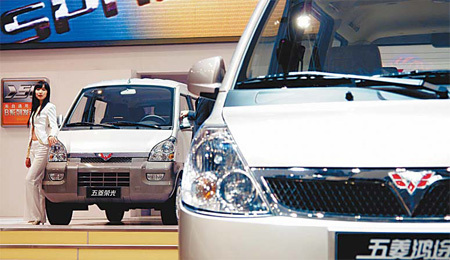 The restructured General Motors Co said yesterday it has begun exporting locally produced Wuling-brand mini commercial vehicles under its international Chevrolet brand name, a clear indication of China's preeminent status in its global market plans. The Detroit-based automaker announced yesterday that its SAIC-GM-Wuling joint venture had signed a framework agreement with GM's former Latin American, African and Middle Eastern operations, and distribution agreements with individual countries to export and distribute two of its most popular mini commercial vehicles from China to markets in South America, the Middle East and North Africa. The first selected vehicles, Wuling N200 and Wuling N300 series, will be sold under its renowned Chevrolet brand through GM's worldwide distribution networks. GM will also provide standard aftersales support. The first shipment of 150 Wuling N200 series products set sail from the Guangzhou port yesterday. "This is an important example of how the new GM is leveraging our global resources at the local level," said Kevin Wale, president and managing director of the GM China Group. "By taking advantage of our unique family of minivans built and sold in China, we will address the need of GM customers in several key markets for affordable transportation for personal and commercial use." SAIC-GM-Wuling, a Liuzhou-based joint venture launched in 2002 between GM China, SAIC and Wuling Motors, manufactures a range of Wuling brand mini-trucks and minivans, as well as the Chevrolet Spark mini-car. "The export of SAIC-GM-Wuling products under the Chevrolet badge demonstrates that our products fully meet GM's advanced global standards for quality," said SAIC-GM-Wuling President Shen Yang. "It also shows our customers in China that they are receiving truly world-class mini vehicles." Under an earlier agreement, SAIC-GM-Wuling began exporting the N200 to Peru in July 2008 as the Chevrolet N200. In 2008, SAIC-GM-Wuling's domestic sales totaled 647,296 units, making it the number one brand in sales among Chinese mini-vehicle producers for the third straight year. Yesterday, GM also announced that it has been the first automaker to break the 1-million-unit sales barrier in China. This is the third consecutive year that GM and its joint ventures have reached the 1-million-unit sales mark in China and the earliest they have achieved the milestone. In 2007, GM became the first global automaker to surpass sales of 1 million units in China in a calendar year. "We will further leverage the global resources of the new GM to offer vehicle buyers across China an unmatched selection of products and services," said Wale. GM has been number one in China among global OEMs in terms of sales and market share in the first seven months of 2009, the result of the record performance of both its Shanghai GM and SAIC-GM-Wuling joint ventures.